The Cherokee Tree Farm South Lake Dam was authorized for construction on August 25, 2008. The authorized surface area of the South Lake is 287.8 acres impounding 2,869 acre-feet of water. The proposed dam structure is designed to allow water flow over the entire length of the dam. In comparison to the previous submission, the proposed structure has a smaller footprint and has a reduced maximum height. The Slag-Cement, Cement-Bentonite Cutoff trench was designed to cutoff water seepage trough and under the earthen dam. The trench extends about 15 feet below the deepest alluvium into the underlying Queen City Sand formation. 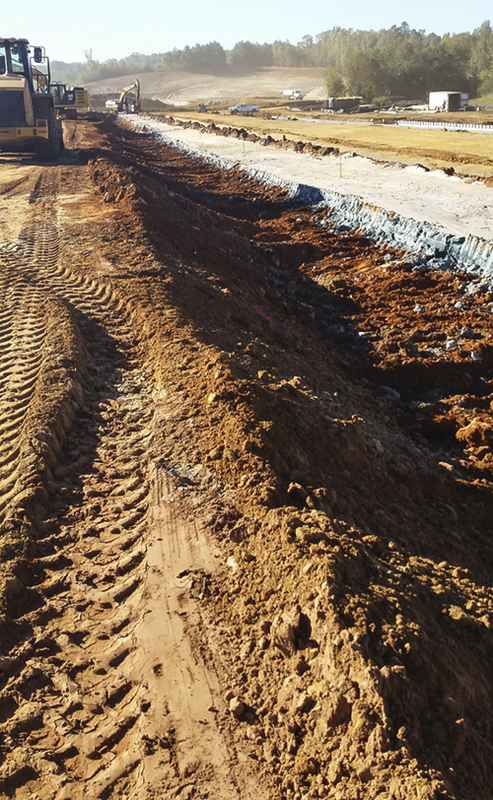 The completed SCCB slurry trench cutoff wall is intended to provide a barrier to passage of groundwater past the dam and a material with clay-like strength. 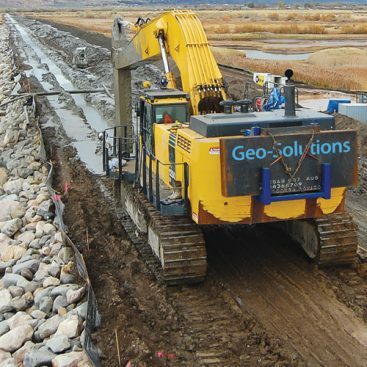 Geo-Solutions installed the SCCB wall using the slurry wall trenching method. 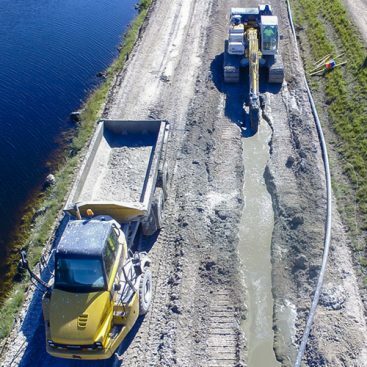 The slurry wall is installed using a custom designed long reach boom and long stick excavator fitted with a three foot wide trenching bucket. The trenching bucket is specifically designed for keying the wall into the Queen City sand formation at the site. 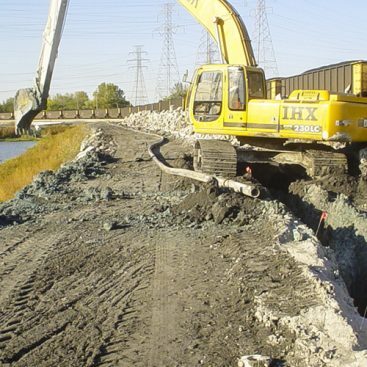 The trench is excavated using Slag-Cement, Cement-Bentonite slurry, which acts as hydraulic shoring during excavation and cures in the trench to become the permanent backfill material. The self-hardening slurry includes a combination of Ground Granulated Blast Furnace Slag cement, Portland cement, and bentonite slurry. The proportions of the mixture were developed during an extensive laboratory testing program that evaluated over a dozen candidate mixtures. The final mix was selected to meet the project requirements of 20 psi for UCS and a maximum permeability of 1×10-7 cm/sec. The SCCB slurry wall is keyed 15 feet into the local sand formation which occurs at depths ranging from 15 to 40 feet below ground surface (bgs), for a maximum trench depth of up to 55 feet. The SCCB wall was a total of 1,900 feet long, including 2 “wing” walls at the dam abutments to prevent water from leaking around the sides of the earthen dam. The wall was constructed from a series of stepped work platforms that were installed by the general contractor. The stepped platforms were necessary to accommodate the natural contours of the existing valley.